Several roles need to be established for the team. 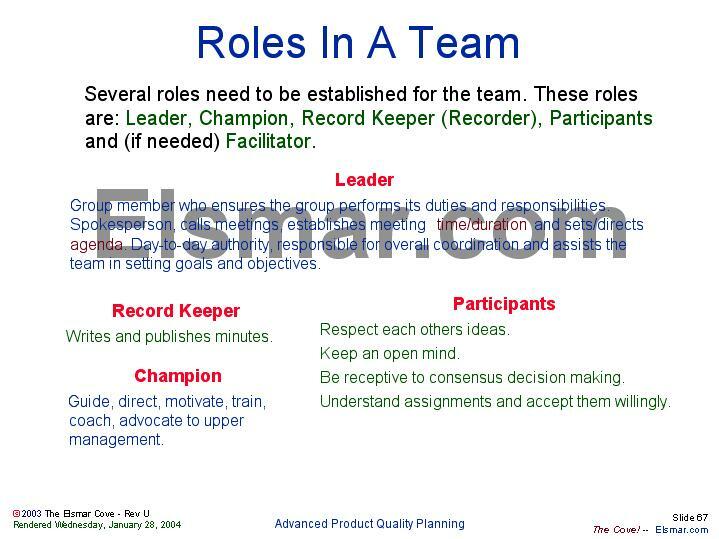 These roles are: Leader, Champion, Record Keeper (Recorder), Participants and (if needed) Facilitator. Group member who ensures the group performs its duties and responsibilities. Spokesperson, calls meetings, establishes meeting time/duration and sets/directs agenda. Day-to-day authority, responsible for overall coordination and assists the team in setting goals and objectives. Be receptive to consensus decision making. Understand assignments and accept them willingly. Guide, direct, motivate, train, coach, advocate to upper management.